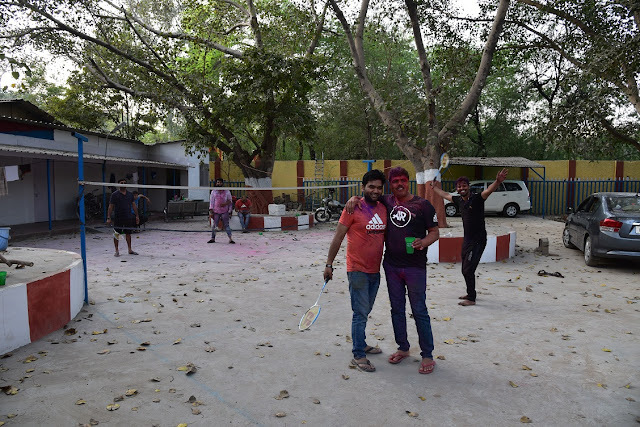 Holi afternoon has a special vibe in Delhi. It is the time when you can actually hear sounds and voices that are usually drowned out in the cacophony of the pulsating megapolis. It is an afternoon when you actually see things that were always there but in the hurry of getting to somewhere, were always missed. Holi is the time of change. 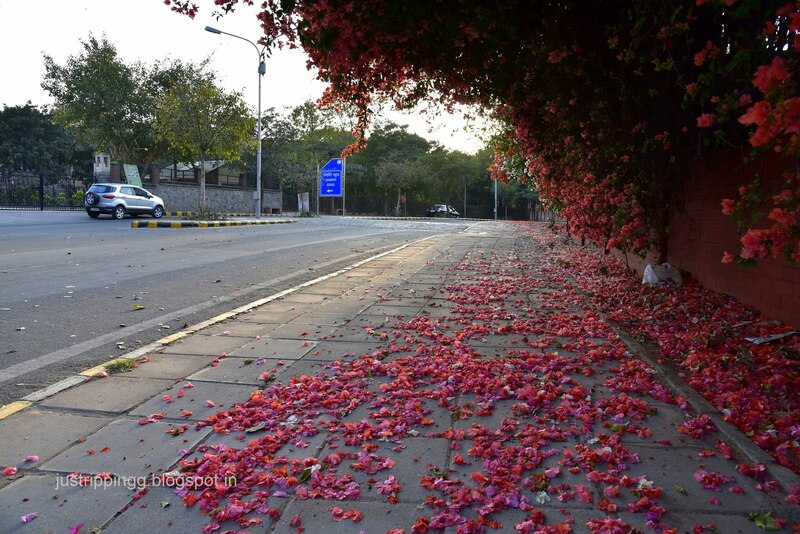 Seasons change, trees lose their leaves, flowers bloom on the roundabouts. Skies shake clear of the pollution of the last few months. This winter has been strangely mild. There have been no rains and the leaves are covered with soot. 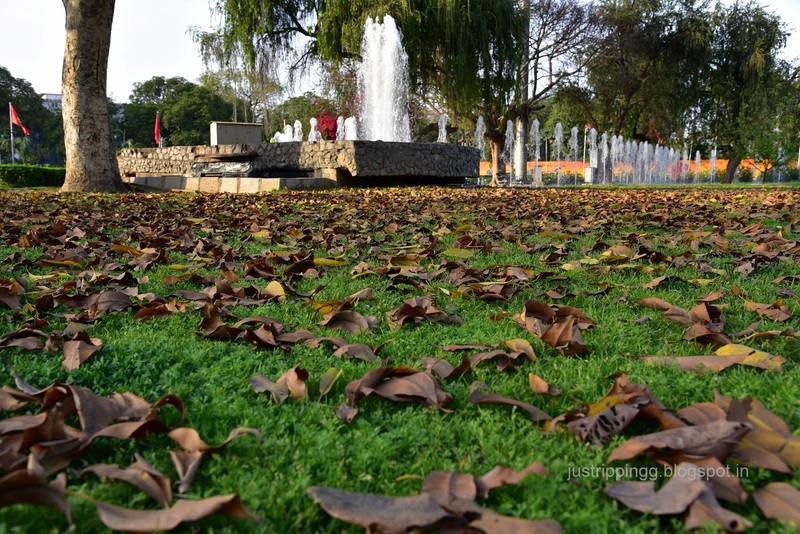 You are looking forward to the new leaves to put some fresh greenness on the roads; especially the Peepal trees that turn into Claude Monet’s canvasses with the new leaves taking colours of all hues. Last year on Holi, you were away witnessing the incredible Holla Mohalla festival up close in Anandpur Sahib, Punjab. 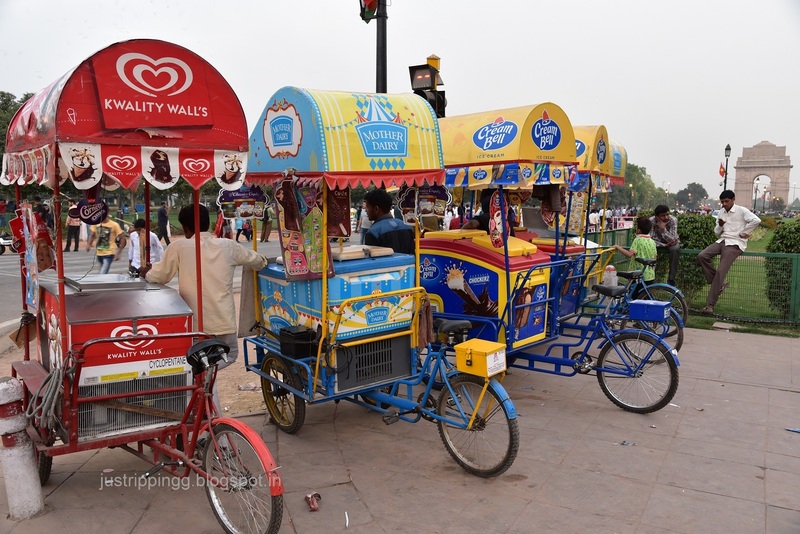 This year you will resume the annual tradition of driving around Delhi on Holi afternoon. 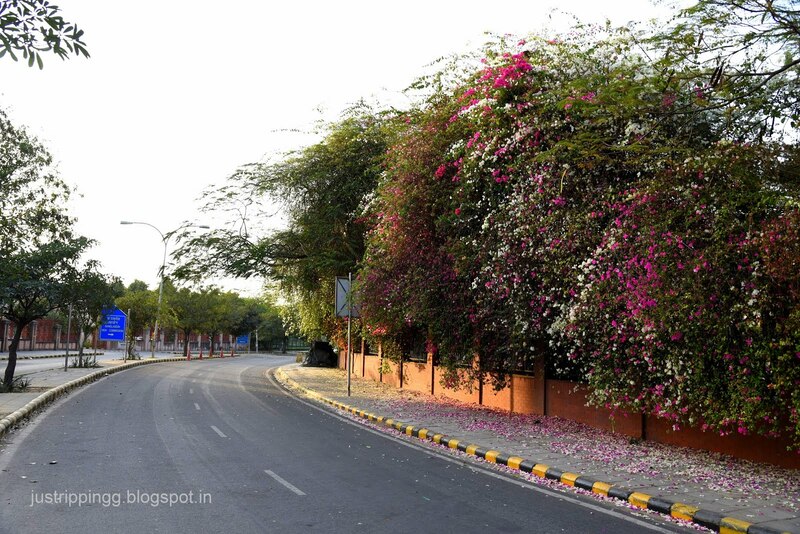 Leaving home, you are greeted by Cotton Silk blooms everywhere – framed against glass buildings of Noida; hanging out with the yellow pods of Siris trees and carpeting the asphalt. 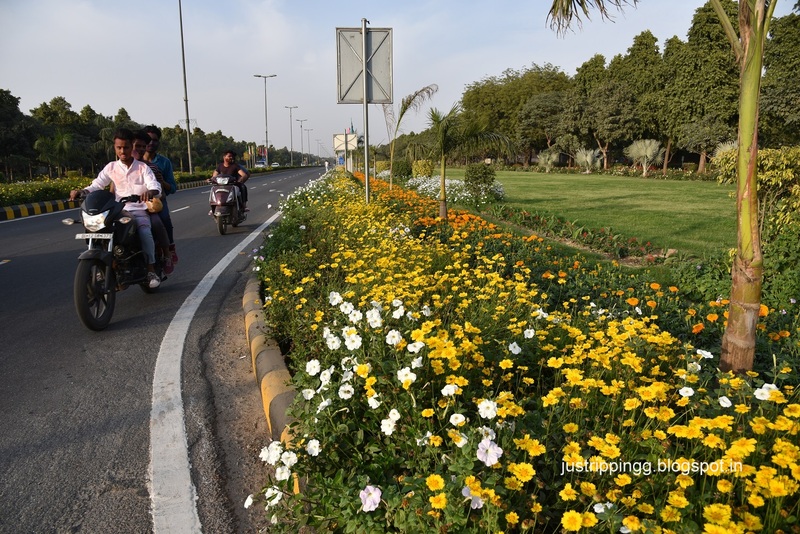 They are probably the biggest and heaviest flowers in Delhi. And you love them plopping on the ground. First thing you notice as you set out on the DND is that there are lot more cars this year. 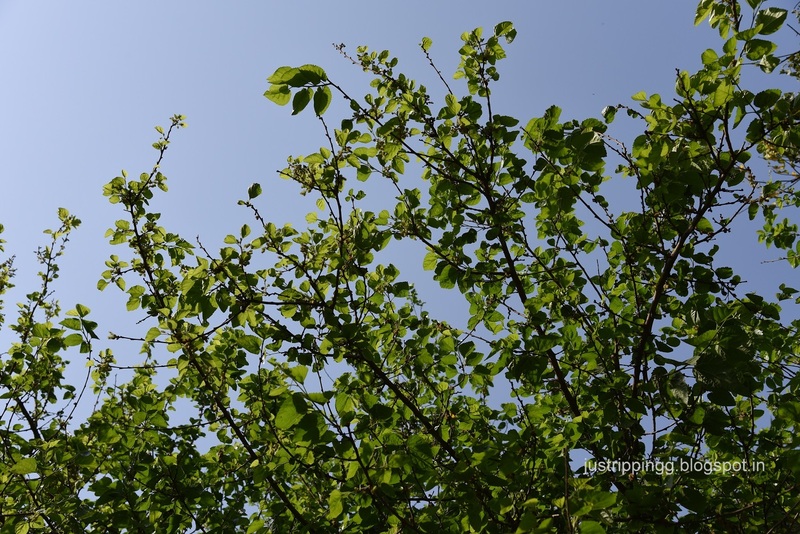 Well, it is the sign of things to come – mild winter, no rain and lots more cars everywhere. 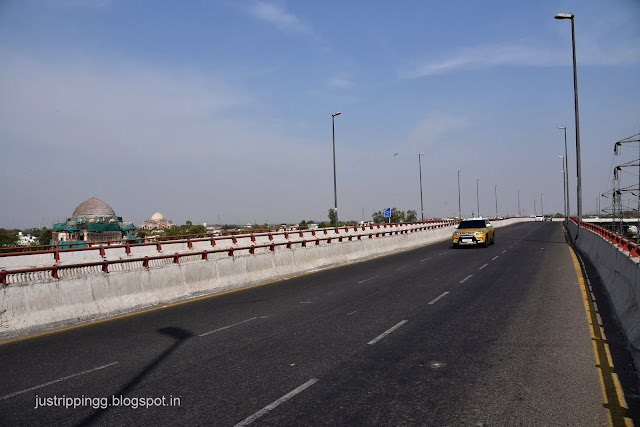 The first stop is on the Barapullah elevated road that takes you directly to your weekend haunts of IHC and IGNCA. 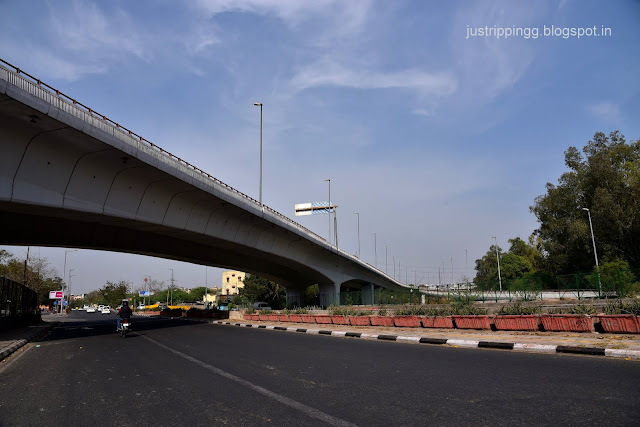 The Barapullah flyover constructed in the run-up to Commonwealth Games of 2010 to ferry athletes from the Commonwealth Village to Jawahar Lal Nehru Stadium in Lodhi Colony is constantly spreading its tentacles. 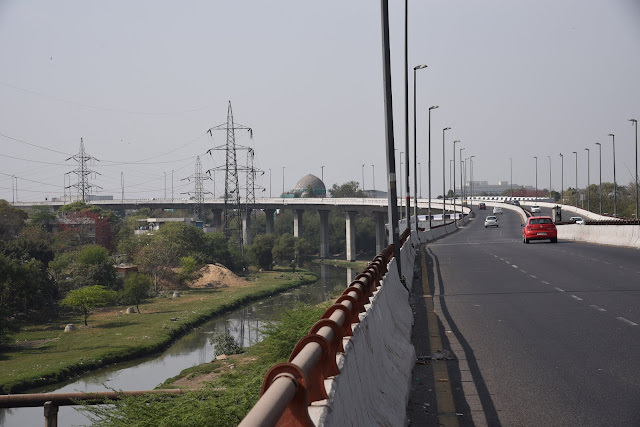 On the West it is being extended to AIIMS and beyond; while to the East it will glide over the Yamuna connecting Mayur Vihar and therefore East Delhi to South Delhi. Yes that’s what we need more of – roads and more cars. Today, you decide to stop midway. On any other day, getting off the car on the elevated Barapullah will be almost suicidal but on Holi, even the passing PCR Van looks at you amusingly. You are just lucky that you stopped at this spot. Looking down, you can see the original Barapullah. 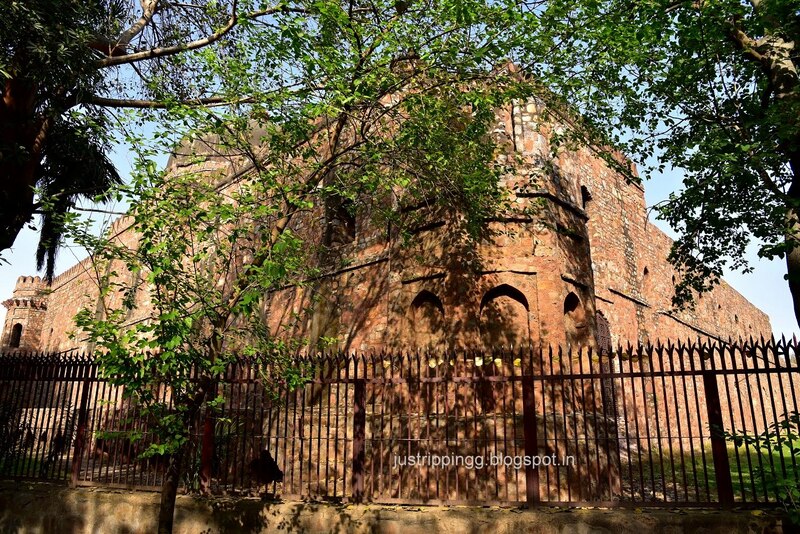 The 17th century bridge with 12 piers and 11 arches, hence the name, built during Jahangir’s time once straddled a Yamuna tributary. Today, you feel sorry for it. 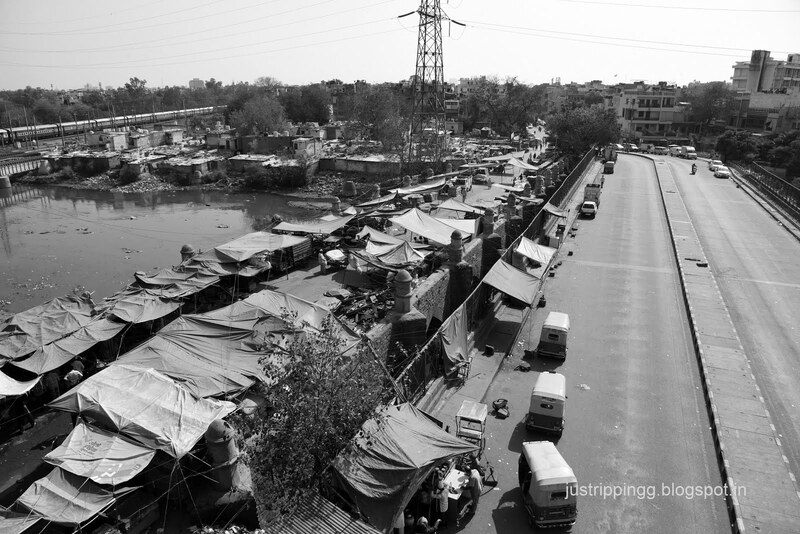 Once the mighty Mughal armies marched over it; today a vegetable market has swallowed it while a foul sewer flows below it. 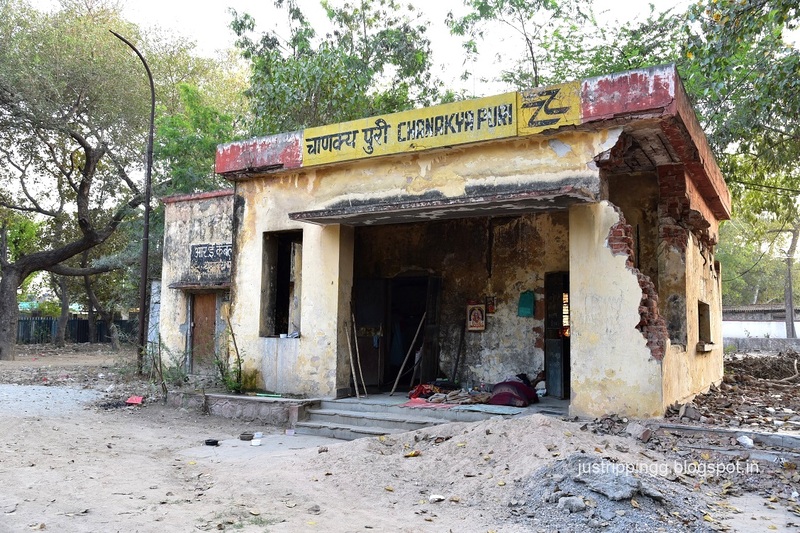 What you see down there is everything that is wrong with preservation of built heritage in our country as pressures of development clash headlong with the past. 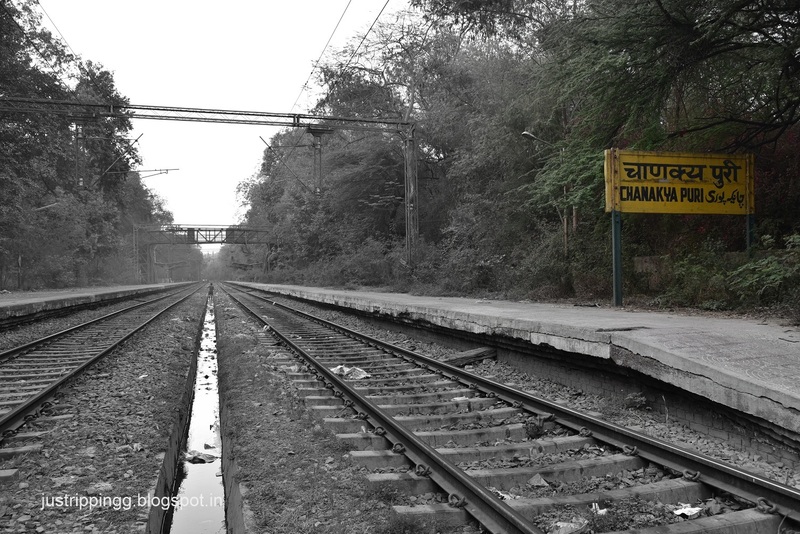 A train departing from the Hazrat Nizamuddin station ambles away lazily. 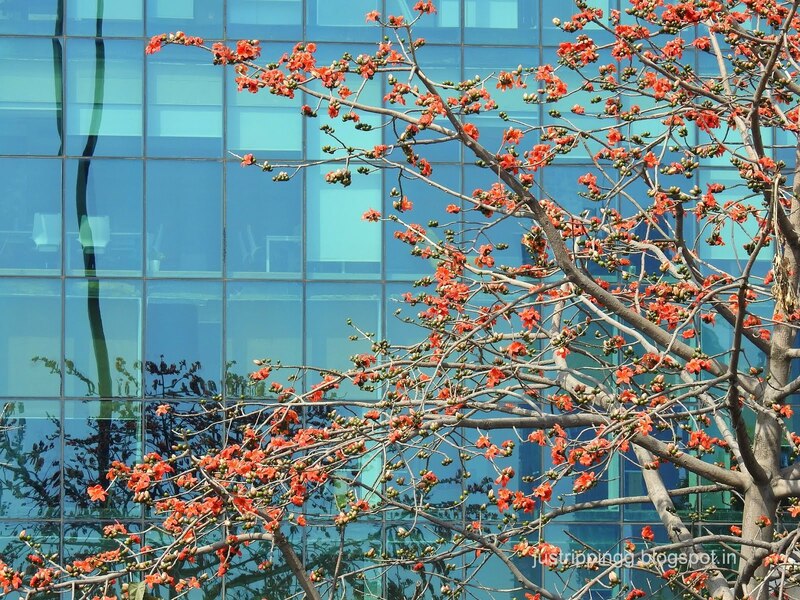 For a moment, the Holi afternoon does feel languid. 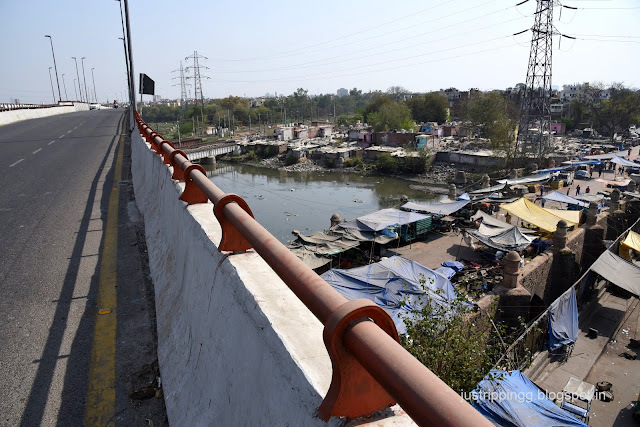 This is the story of Delhi’s changing face in a frame – a 17th century bridge used by caravans and marching armies, a 20th century railway line carrying hundreds of passengers along the same Deccan route and a 21st century elevated road soaring above the apathy of both citizens and government. Up ahead, you can finally frame Khan-i-Khanan Tomb (Akbar’s general who wrote those adorable dohas under the name Rahim) with Humayun Tomb’s Dome. You still can’t figure out why they are renovating the Khan-i- Khanan Tomb – it looked just right with its stripped look conveying the essence of Rahim’s life. They could have better used their resources elsewhere. 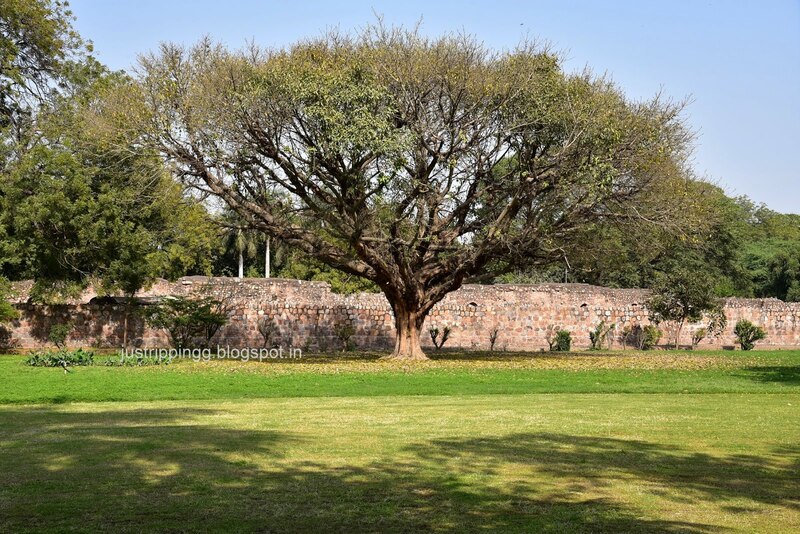 But then you are not a fan of Aga Khan Foundation restoration work. 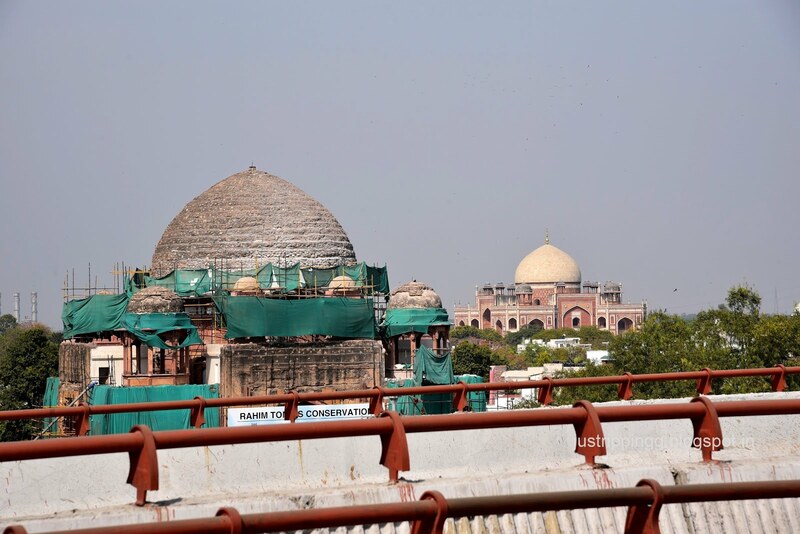 The restored structures in Sunder Nursery and Humayun Tomb complex are already coming apart. Enough of the rant. 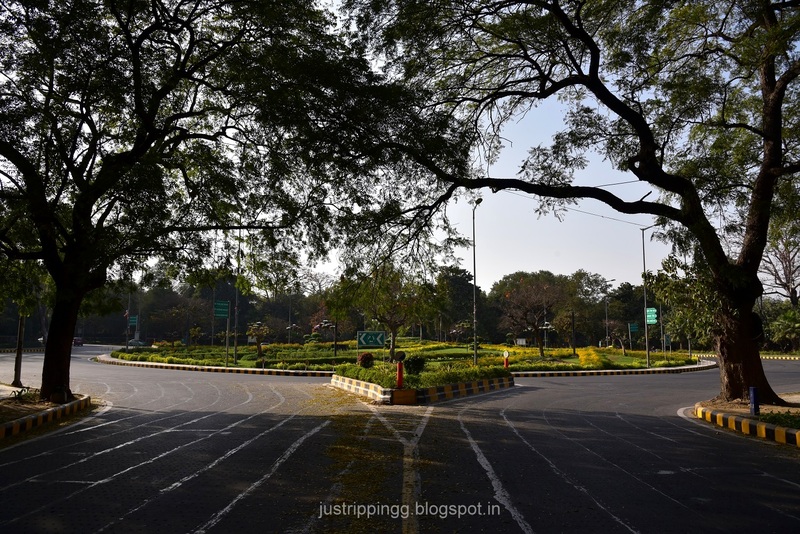 You get off at the Pragati Maidan exit. 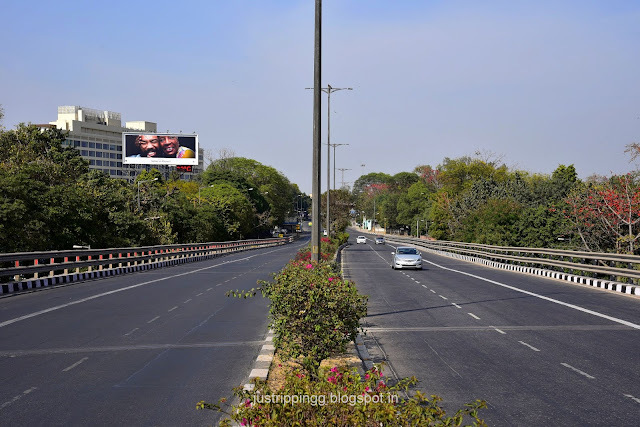 Up ahead is the Lodhi Road flyover. On the right is Nizamuddin Basti with the famous shrine of Nizamuddin Auliya where you recently witnessed the incredible Basant Panchami celebrations and the Humayun Tomb complex just ahead. 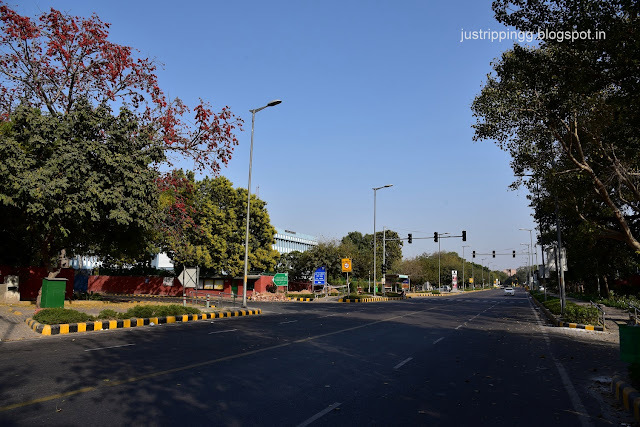 On the left is the Lodhi Road with IHC and the pleasant Lodhi Gardens that you can frequent any number of times. And then you see the scene that you have missed so far. 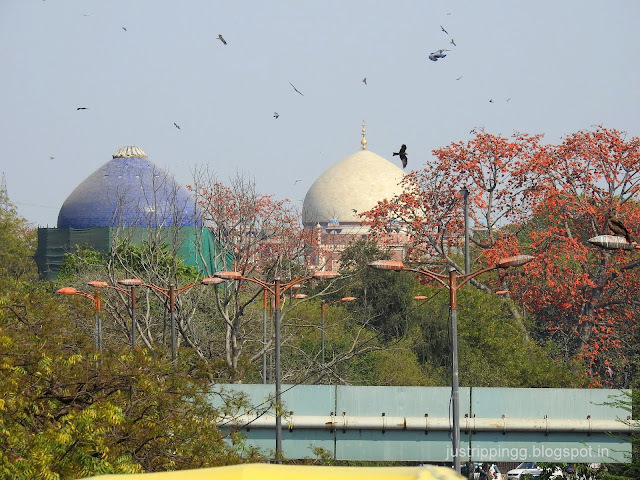 From the top of the flyover you can see the domes of Subz Burj and Humayun Tomb framed together with Silk Cotton blooms. Eagles soar in the skies in the pleasant breeze. A part of city that is furiously in motion otherwise, seems to have frozen in a stupor. The sounds, the voices, the din has all dimmed. It is as if you can listen to the flap of wings of the eagles. You could watch this scene forever. This is only possible on Holi afternoon. 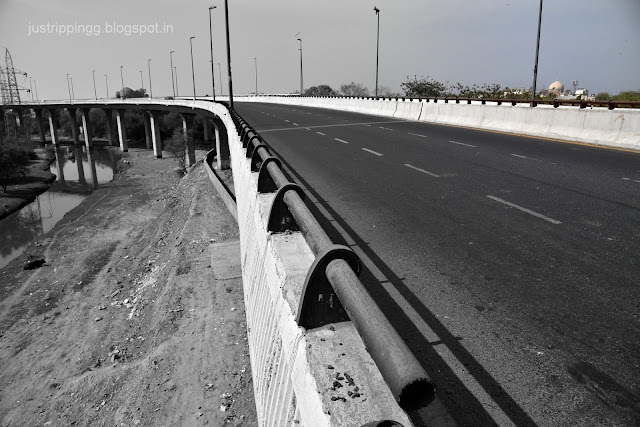 Driving down the flyover, the sight ahead makes you stop in your tracks. 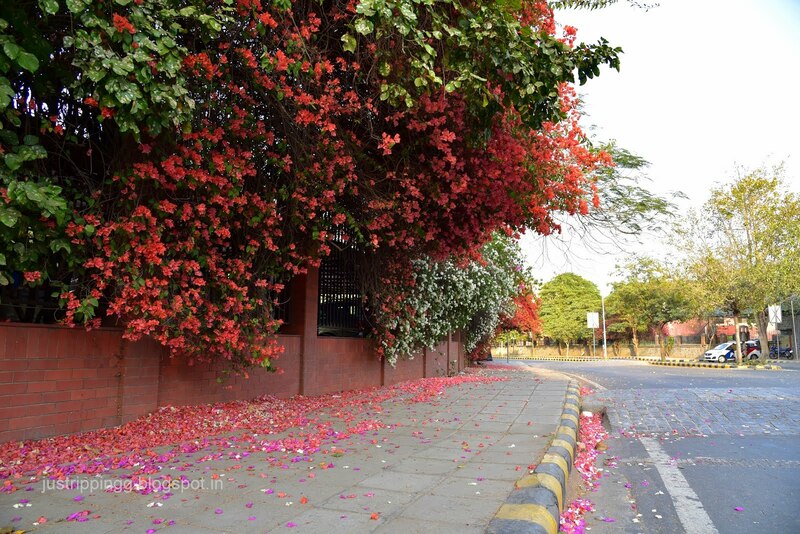 While the major blooming is still few weeks away, Delhi still has its surprises. 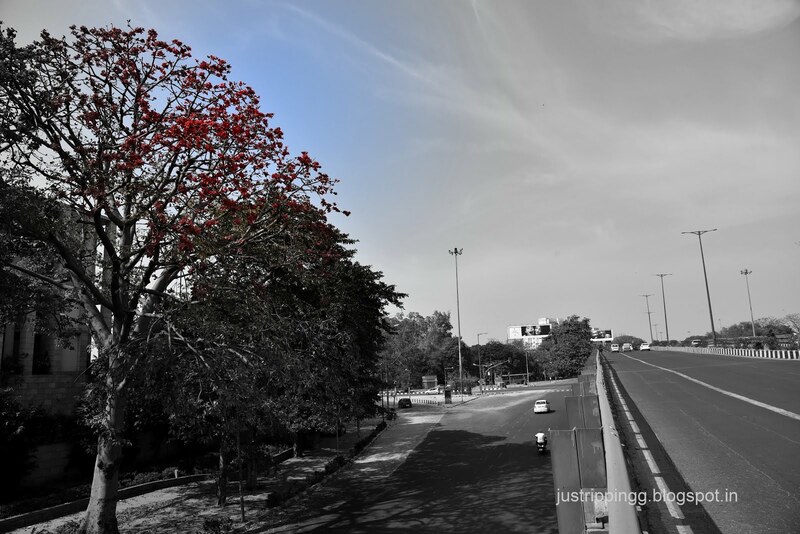 So even as the now common red and orange blooms of bare Silk Cotton trees light up the skies, it is the little surprises that can only be found on Holi when you can actually take your eyes off the road. Last year it was the discovery of seemingly diamond encrusted trees of Leza (Lagerstroemia tomentosa) on Rajpath by India Gate; this time it is another tree glinting with opals and moonstones. 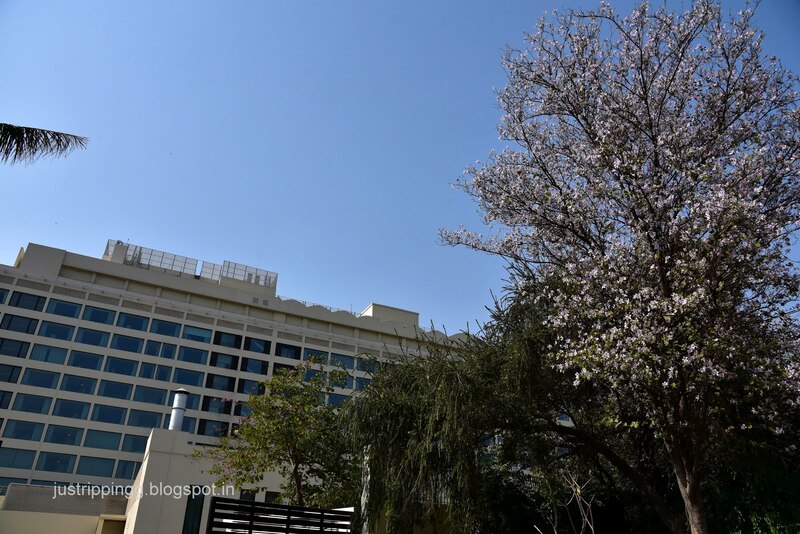 The newly refurbished Oberoi Hotel looks resplendent in the company of Kachnar (Bauhinia variegata). Usually the Kachnars are purple with another variety candida that are white with lemon green stripes. However, these orchid like flowers are white with purple stripes. That is not surprising since the tree is also called Poor Man’s Orchid! 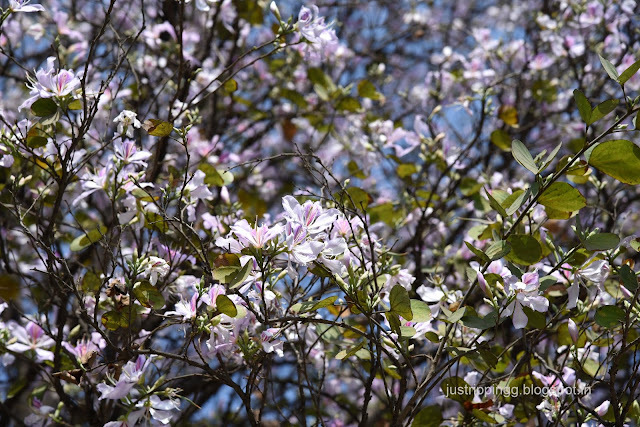 You are pretty sure, the tree was not blooming during the earlier Holis and the photographs also confirm that. 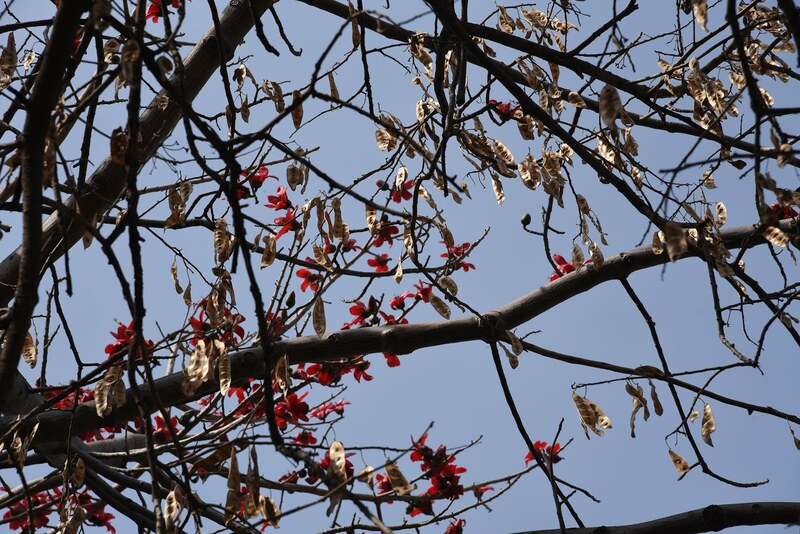 Has the warm winter preponed the flowering? 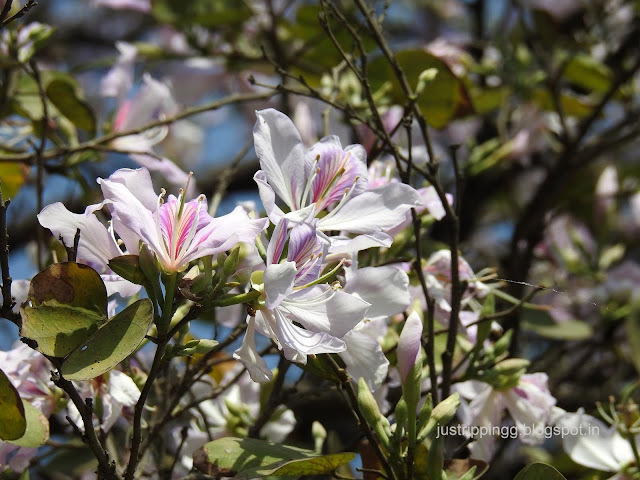 You are pretty sure the changing seasons are scrambling the plants’ cycles too. 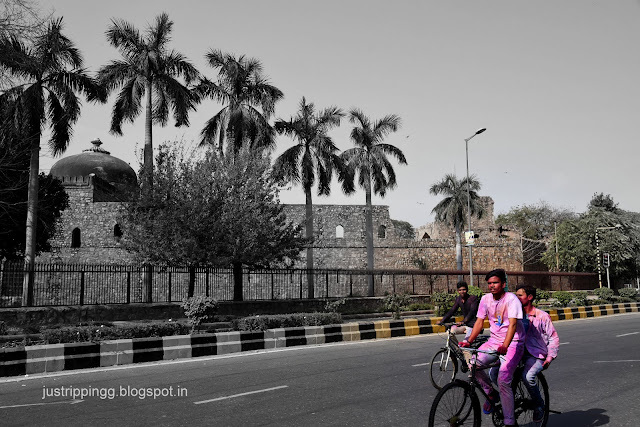 At Purana Qila, you turn left. On the right is Bapa Nagar with the mosque Khairul Manazil built by Maham Angah in 1561-62, Akbar’s famous wet nurse and mother of Adham Khan. Yes, though Akbar built his capital in Fatehpuri Sikri and was buried in Sikandra near Agra, Delhi has lots of buildings built during his time by people that played major roles in his life. 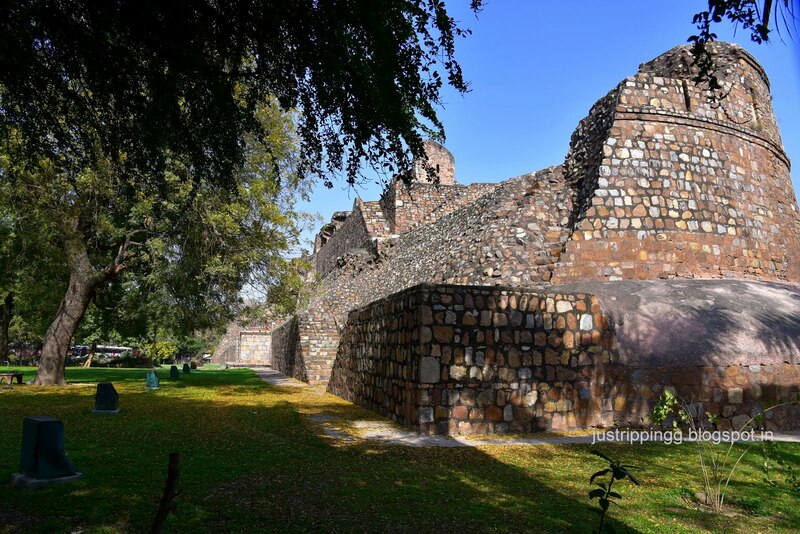 Just beyond is the area around Lal Darwaza built as part of Shergarh, Sher Shah Suri’s city, in and around Humayun’s Purana Qila. 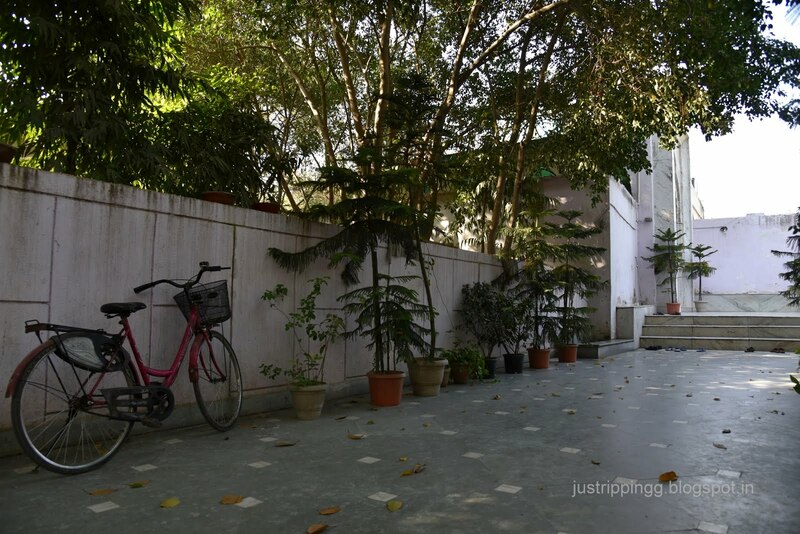 Crossing back you enter another government colony housing babus and bureaucrats. Another Delhi’s surprise awaits you. 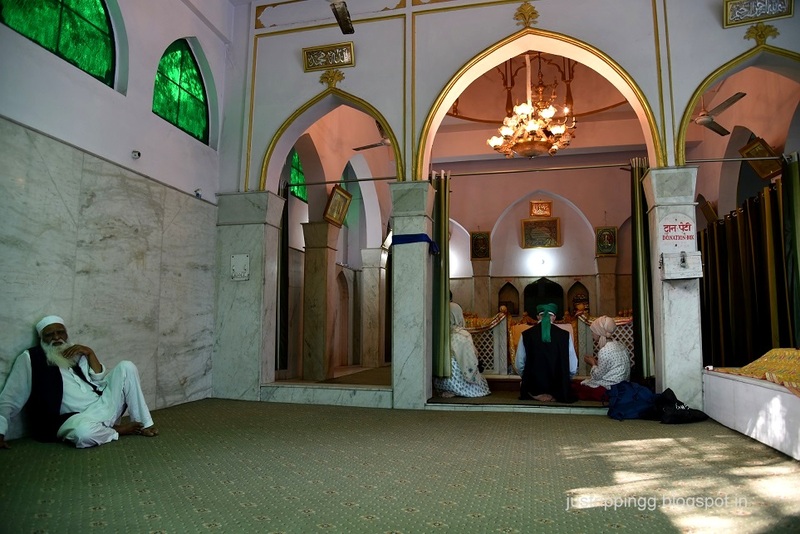 Delhi has several Sufi shrines dedicated to male saints, but there is one little known dargah situated in the leafy interiors of Kaka Nagar that is dedicated to Bibi Fatima Sam. This is a huge surprise considering that women are barred from entering most of the dargahs. The Mutawali, Haji Abdul Rasheed, caretaker for over 50 years, informs that Bibi Fatima is considered to be the sister of all Sufi saints. And because she called you that you have come. 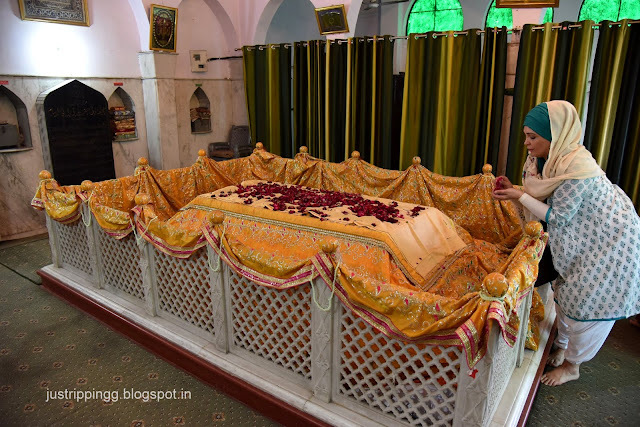 Hazrat Nizamuddin would come to her grave to pray. His dargah, the most famous in Delhi, is not far away. Today few pilgrims, probably from Central Asia, have arrived. It is serene here. And this is what you love. Lot of familiar DTC Bus Routes on that sign! 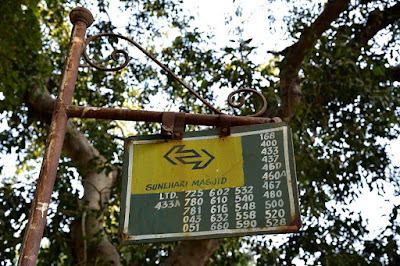 But where is the Sunheri Masjid on Krishna Menon Marg - something to explore! The roundabouts are sadly subdued and lacklustre this year. You were spoiled by the sheer variety and the mindboggling displays last year. Maybe all your gushing over has jinxed them this year. NDMC apparently is having an off year. Armed guards meant that you have never braved stopping at the roundabout in front of Prime Minister’s residence. 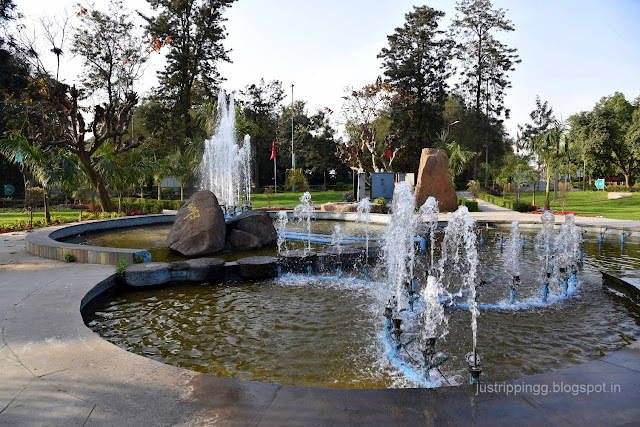 This roundabout has always been beautiful. You are desperate this year. Fountains spew water. South Block looms in the distance. Your cover is blown. Whistles ring out – you scoot out immediately in one piece. You are back at your favourite roundabout where you played hide and seek during summer nights and rolled down the grassy slopes. You can still feel the coolness of the grass on your face. The place has got a name makeover. But thankfully the original name survives hyphenated with an extension. 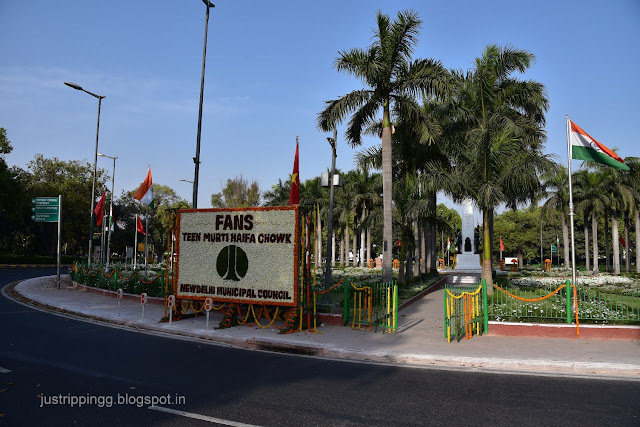 During Israel’s Prime Minister’s recent visit, the roundabout has been renamed as Teen Murti – Haifa Chowk in the centenary year of Battle for Haifa in 1918. Teen Murti is a memorial to Indian soldiers of Hyderabad, Mysore and Jodhpur princely states, part of the 15th Imperial Service Cavalry Brigade who died in the Great War of 1914-19. 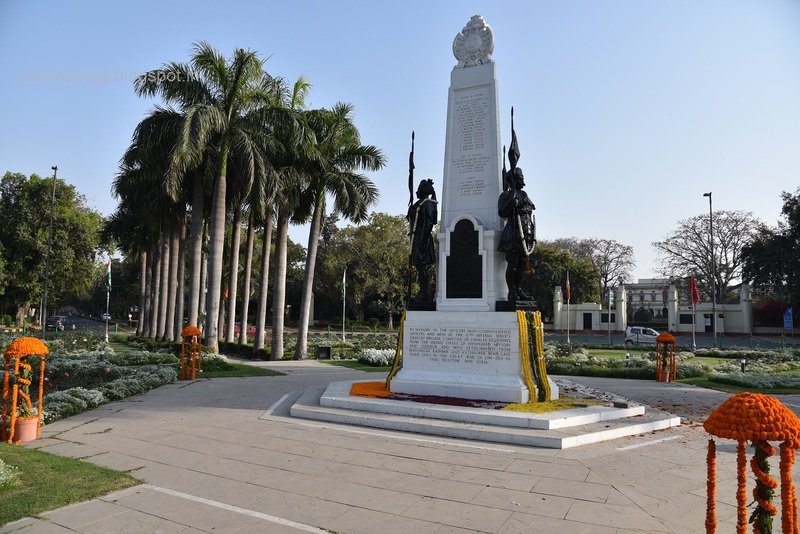 Nearly 900 Indian soldiers are buried in Israel, their ultimate sacrifice liberating Haifa from 400 years of Ottoman rule. 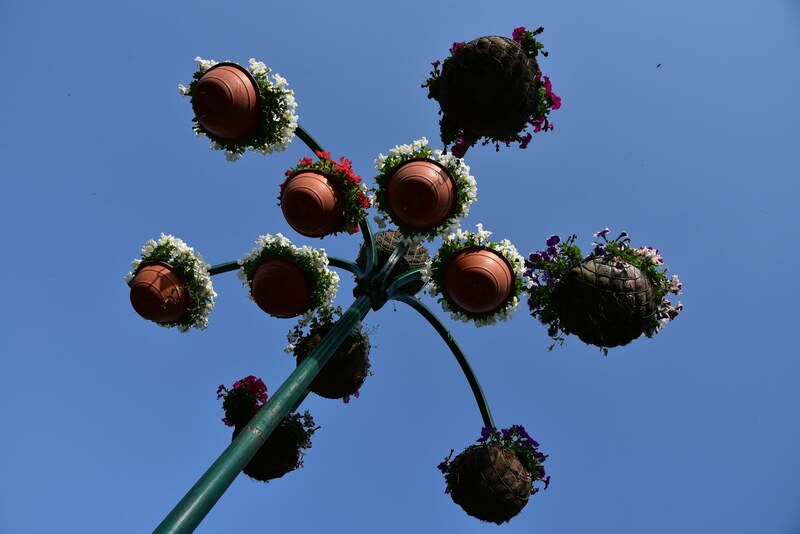 The theme is white this year and the beds are covered with white petunias (Petunia hybrid) and candytuft (Iberi samara) flowers. A commemorative ceremony seems to have been recently conducted. 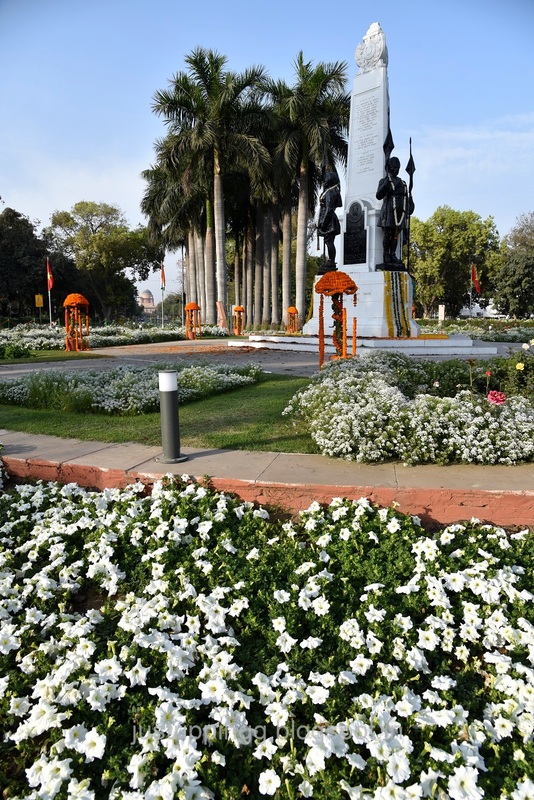 The statues are garlanded even as marigold garlands light up the white flowerscape. Shanti Path flanked with embassies on both sides, is probably the most atmospheric street after Rajpath. You still remember the faintly fragrant white petunias lining either side of the road last year. This time they have been replaced by marigolds. You were looking forward to inhaling the scent of the petunias. Nevertheless the huge marigolds that seem like the Orange African varieties are quite hot. Moving deeper into the Diplomatic Enclave beyond Satya Marg, you turn left on to Dr S. Radhakrishnan Marg. The sight leaves you breathless. The pavement hugging the Bangladesh Embassy seems to have been doused in kaleidoscopic Holi colours. 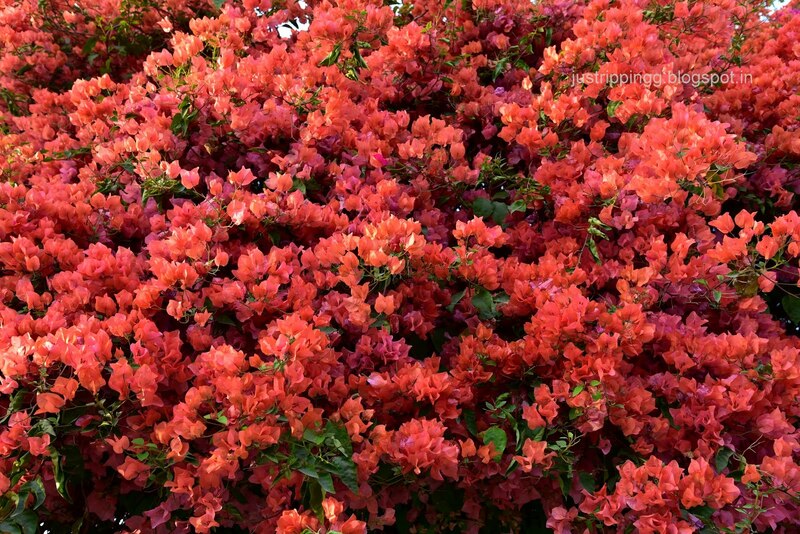 Bougainvillea of all colours forma canopy over the pavement. This is hands down the prettiest street all day. 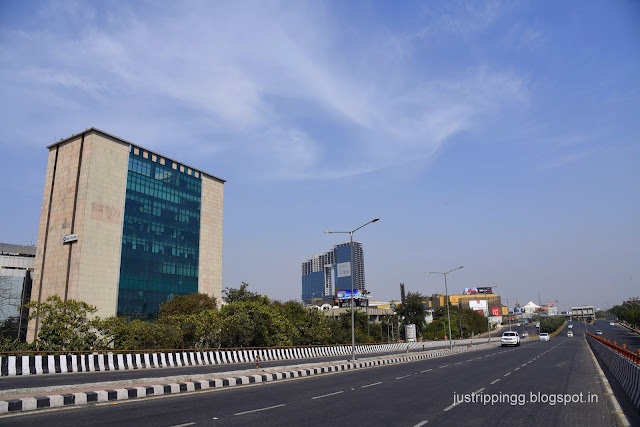 Imagine if all the roads in Delhi were like this. 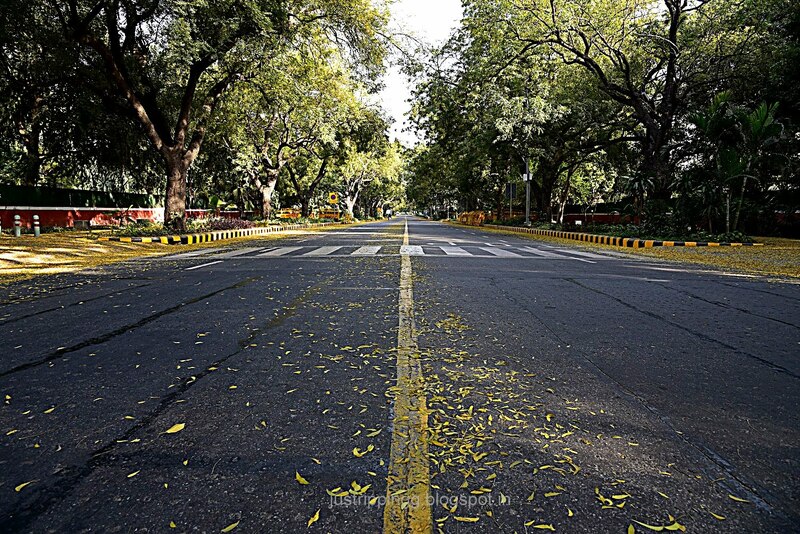 Delhi would be the prettiest city. You need to go deeper. 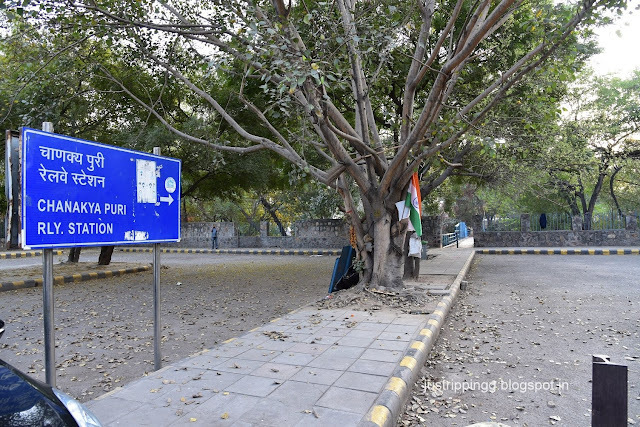 Moving on to San Martin Marg, you turn right onto Abai Marg. You find the sign for what you were looking for. 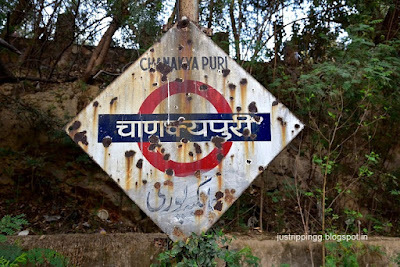 This is the Chanakya Puri Railway Station. A bunch of Black & Yellow taxis wait outside. The drivers sit around waiting for telephone calls. Do people still call for taxis?Maybe they don’t have smart phones. 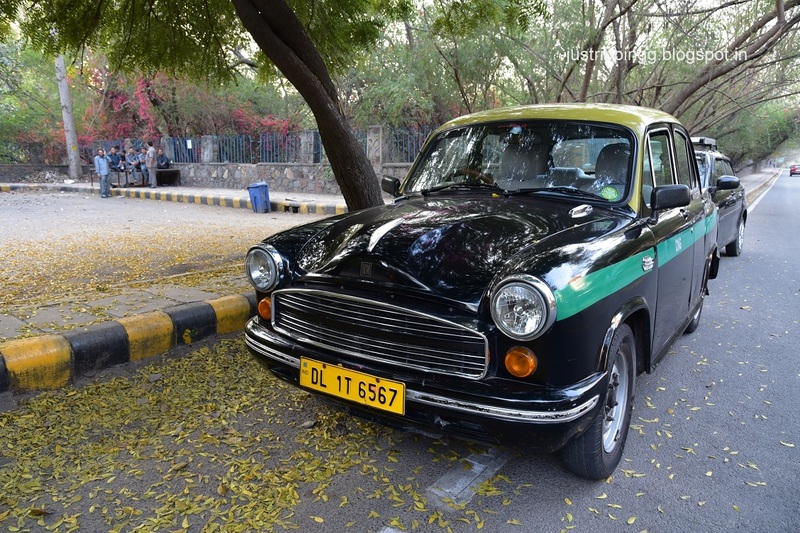 Black and yellow taxis in the city seem to be on the endangered list. Stairs lead down onto the platforms. This being the ridge area, the railway line has been cut through the hills. 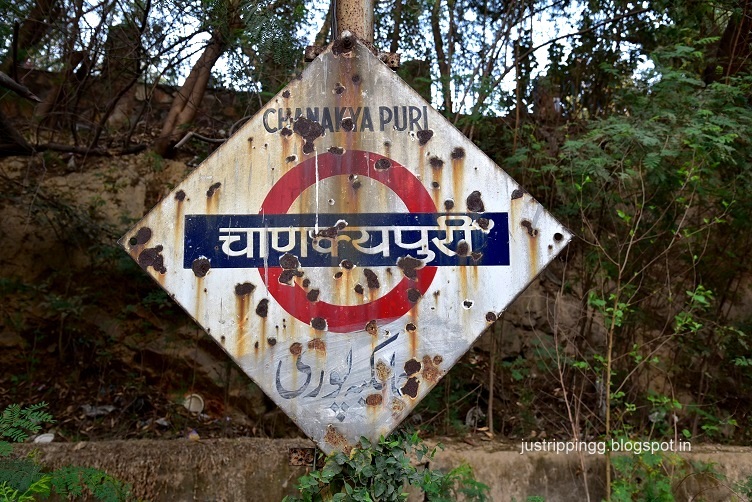 One of these days you have to ride the ring railway introduced during the Asiad Games of 1982. 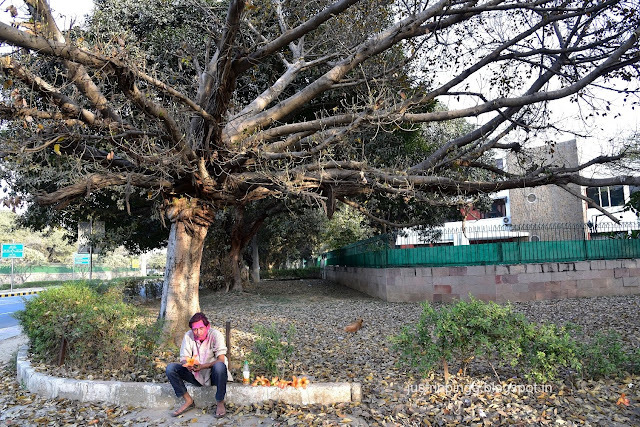 Few men wash their holi coloured clothes in the drain flowing in the middle. Some cops, wonder what you are doing here. You ask them the same question. They are on VIP duty. Really! On the other side the ticket booth seems to be close to being demolished. More cops play badminton. There is one last place to see before you head out to Vijay Chowk. 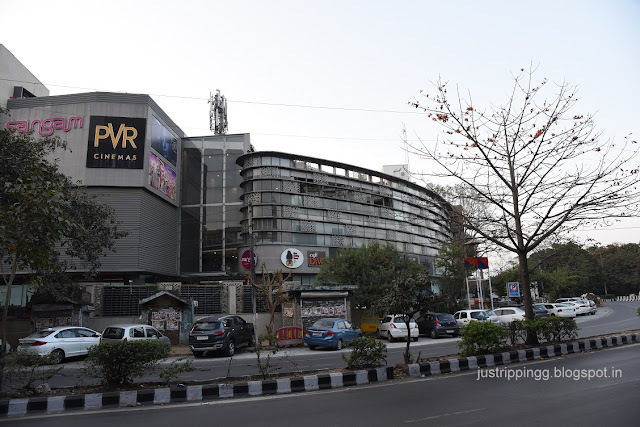 It is time to leave the NDMC city limits, cross the Ring Road and turn left into Major Somnath Marg and drive into RK Puram to see if the Sangam Cinema has survived in its original avatar or turned into a multiplex or worse a shopping mall. This is Tamil territory as men in lungis mill around. 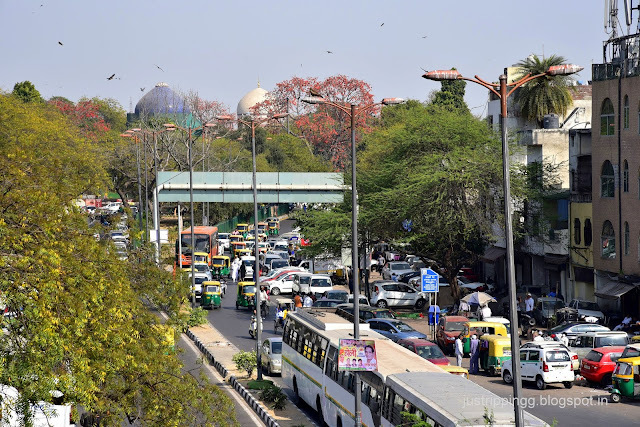 Well Delhi is changing and why would Sangam remain the same. Sangam has changed into a hip-looking almost Dubaisque multiplex with high-end stores and restaurants. The charm of childhood will soon be lost. The government colonies of Kidwai Nagar, Lakshmibai Nagar are being flattened to build monstrous multi-storey buildings. 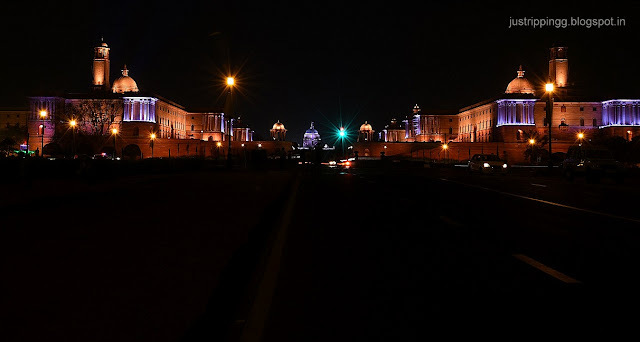 It is just a matter of time when Lutyens Delhi too will lose its character and charm. 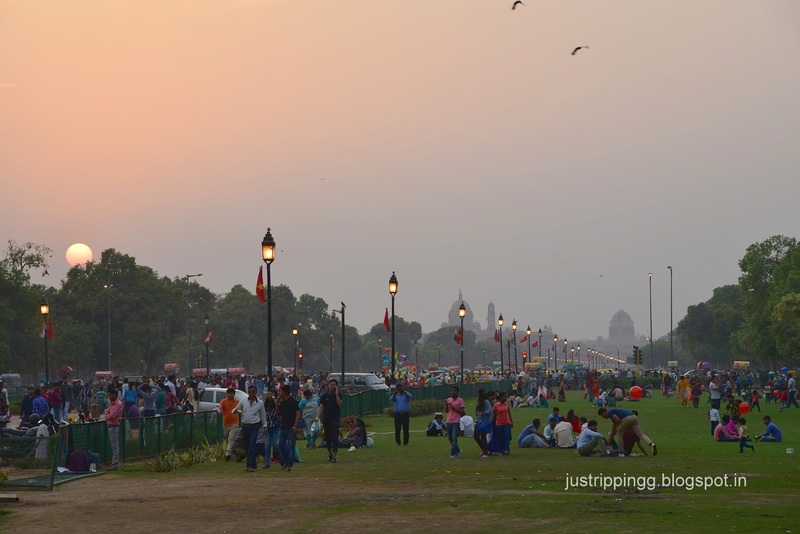 Oh well before that happens it is time to move to Vijay Chowk as dusk descends. The entire secretariat and Rashtrapati Bhawan has got new set of cool lights. 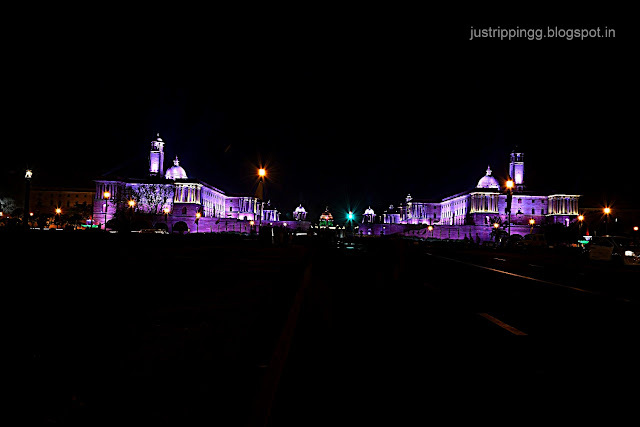 The already beautiful Raisina Hill looks even more gorgeous. 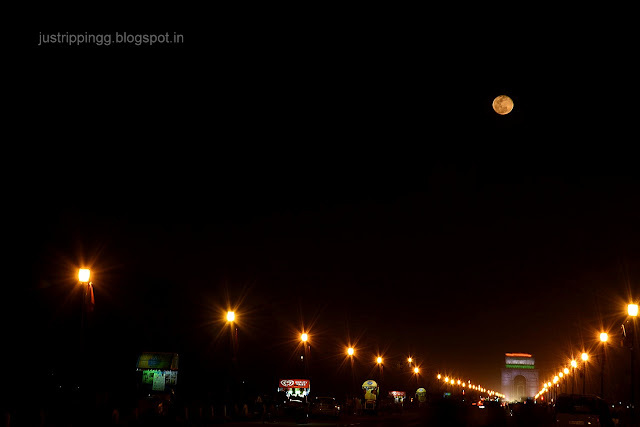 After a quick round of the India Gate, you come back to Rajpath to set your tripod and wait for the moon to rise. The moon always appears catching you with surprise. Somebody just flicks a switch and it is there. The moon in all its glory, full and red, seems to be suspended over the Rai Jamun trees. 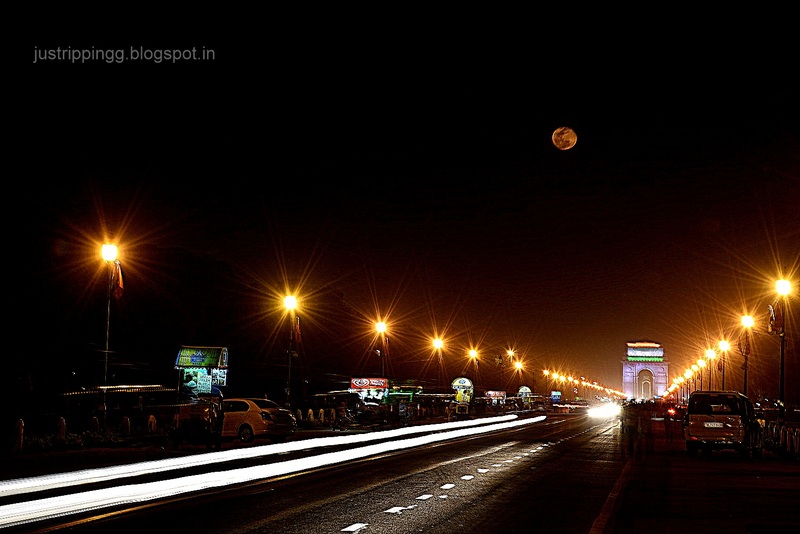 It is hard to figure out who looks prettier – the moon or the India Gate. The sight gets etched inside you. You are transfixed. 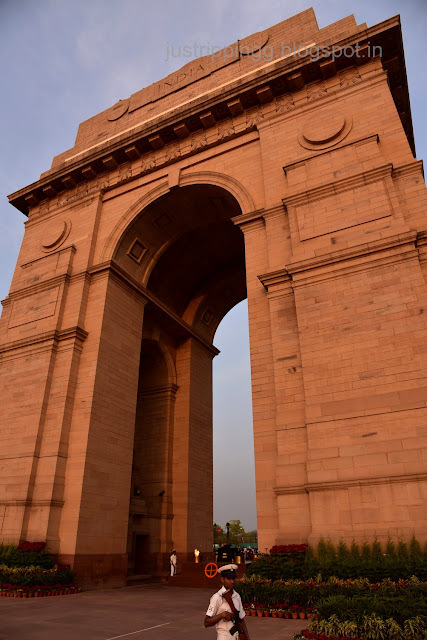 By the time you snap out of the reverie and figure out the settings of the camera, the moon has already climbed over India Gate. The sight is simply fascinating. It was as if Edwin Lutyens had designed the entire vista with the rising moon in mind. 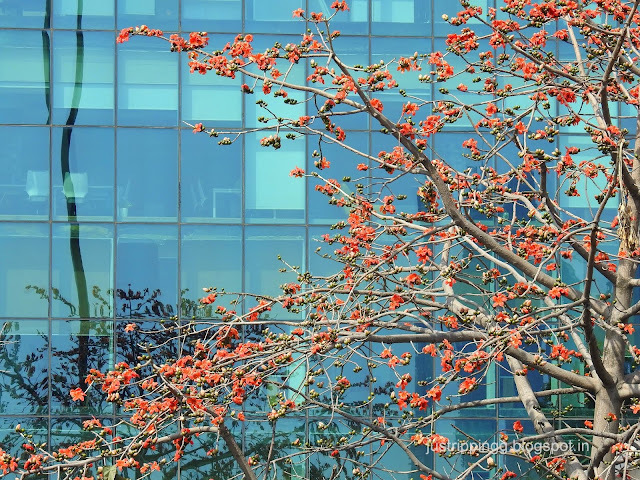 You just wonder, in the grind of our daily lives, how many times do we actually pause and observe all this beauty around us – especially in a city which for few months becomes unliveable. But for you these few hours take you back to the innocent times when New Delhi was just a slow-paced city as you rode a scooter. As you drive back over the Yamuna a smile plays on your face. 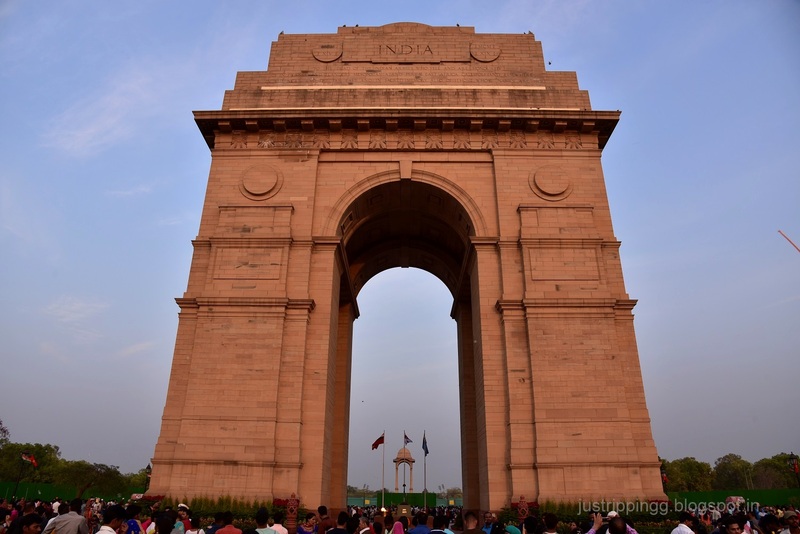 Even with growing years, a few hours in New Delhi brings back the childhood Wonder Years. Those memories, those times will always be fresh and fragrant like the petunias, candytufts and roses of Teen Murti. Alright Teen Murti – Haifa Chowk! So happy to read you after a long time! It felt like a journey across timelines that are separated by different doors. Seems those doors are thrown open only on the afternoons of Holi for the people taking nostalgic trips down the memory lane and beyond. 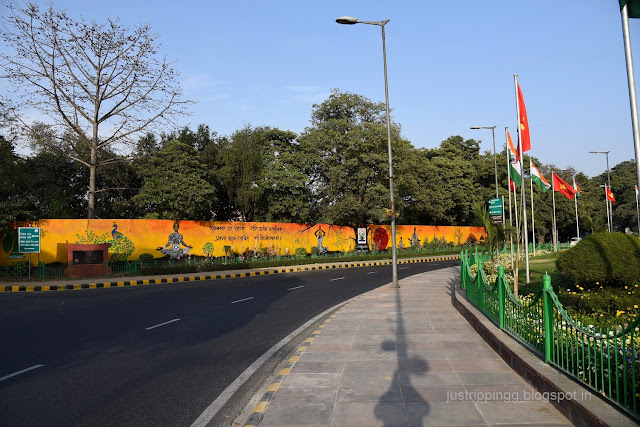 Holi Day in Delhi captures the essence of your beloved city in its vibrant colour and fervour. The story is resplendent with all the hues that Holi brings. The magic moments took your photographs to the next level. Yes, even further. Got to know a lot about Delhi old and new as the compelling drive breezed through the layers of time. 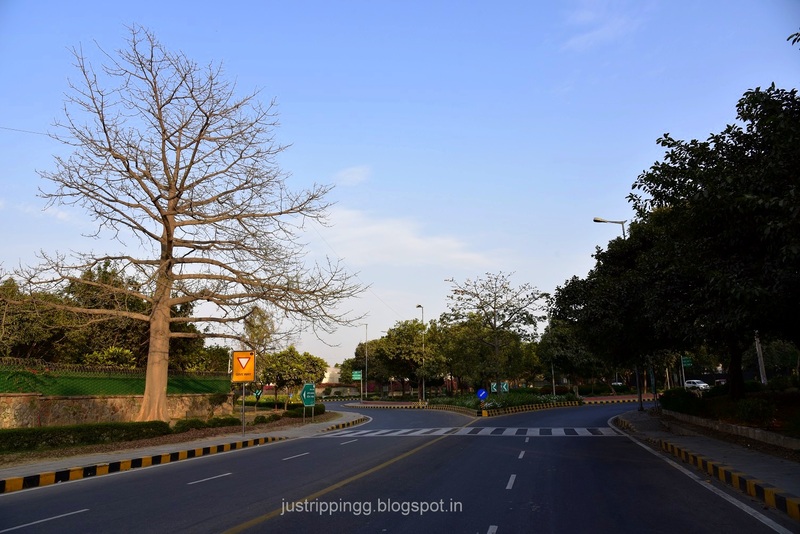 For someone who is not familiar with Delhi, it’s like finding the way through a maze of realms. When I finally emerged out of the maze through the India Gate, I saw the most glorious moon. 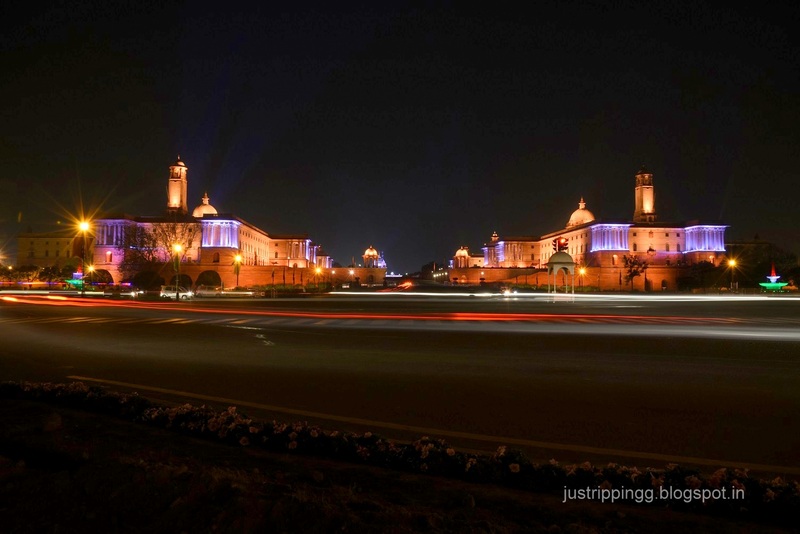 Yes, Lutyens had designed the entire vista with the rising moon in mind. I'm convinced. This is always a soul satisfying time machine trip into the past, present and the future. These are few hours of total bliss. Thanks for reading and for your always effusive appreciation that is both motivating and hardly deserved. There is something about this day sweet, romantic, nostalgic and uplifting. Hope you continue to show love for the city like we all do.